The police prevented a man arrested from the opposition’s anti-government protest on May 1 from going to his father’s funeral prayers. Abdulla Fahmy, a 48-year-old fisherman, said he had traveled from Gaaf Alif Kolamaafushi to Malé in March to get medical care for his elderly father, who was suffering from heart, kidney and lung issues. Fahmy’s father was hospitalised at the Indira Gandhi Memorial Hospital (IGMH) in March. 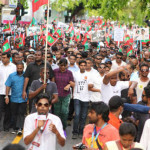 Although Fahmy is a member of the main opposition Maldivian Democratic Party, he said he had not participated in the protest. He had gone to the Bandaara mosque near the Supreme Court for dusk prayers when he saw hundreds of protesters marching towards the restricted Republic Square. “I only come to Malé once in six years or three years. How can I participate in a protest?” he said. 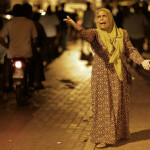 A police vehicle arrived and set up barricades at the corner of the mosque, and dozens of protesters entered the mosque. Police ordered the protesters to leave the area and pepper sprayed many outside the mosque. Fahmy was arrested along with several others. “I showed them the hospital pass I use to enter my father’s ward at the IGMH. But they refused to listen to me,” he told Minivan News. He was handcuffed and taken to the detention centre on Dhoonidhoo Island. Some 193 protesters were arrested on May Day. Nearly 20,000 people participated in the rally and called for the release of jailed ex-president Mohamed Nasheed and ex-defence minister Mohamed Nazim. Violent clashes broke out between protesters and police soon afterwards. 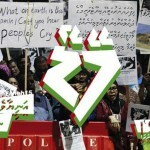 The next day, the criminal court granted a blanket remand 15-days for 173 of the 193 protesters. On May 4, Fahmy was brought to Malé around noon and taken to the cemetery in handcuffs and police officers told him his father had passed away. “I was only allowed to see my father’s face for ten minutes. They removed my cuffs, but I was flanked by police officers when I went inside the cemetery and was told I could not talk to my family members. I begged the police to let me participate in the funeral prayers, but they refused,” he said. Fahmy was then taken to the Atholhuvehi station in Malé, “For one hour I begged them to allow me to go to the prayers.” But he was taken back to Dhoonidhoo. In Dhoonidhoo, his 25 cellmates held a prayer for Fahmy’s father. One cellmate told Minivan News that Fahmy “was broken into pieces,” when he came back to Dhoonidhoo. On the seventh day, Fahmy was released and is now back in Kolamafushi. He had been arrested on charges of disobedience to order, but he said police later accused him of throwing rocks. He has denied the charges. The Prosecutor General’s office said police had asked for charges to be filed against Fahmy, but the case has been sent back to the police for further clarification. 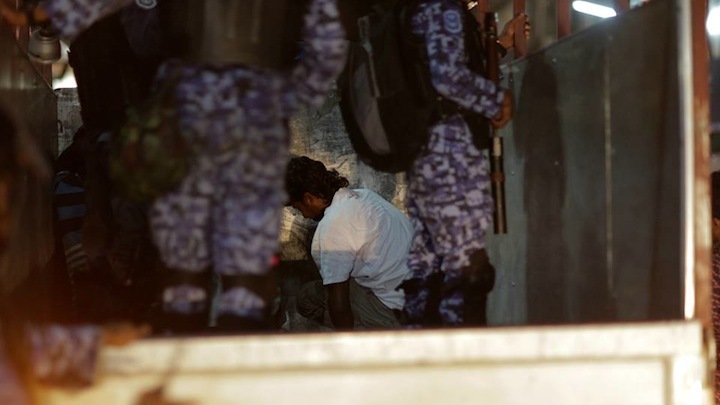 A police spokesperson initially said no arrests had taken place at the Bandaara Mosque, and asked for more time to check on the details of Fahmy’s case. The police were not responding to calls at the time of going to press. All of the May Day detainees have now been released. However, Adhaalath Party president Sheikh Imran Abdulla and 14 people arrested on charges of assaulting police officers remain in custody. I was really touched by what happen, but still some ignorant Maldivian will say cause he went to mosque he was arrest. Allah please show the right path to those ignorant people.